Stats: Shut Up Kelly! 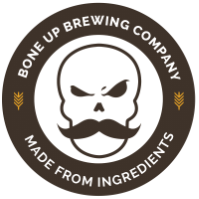 - Bone Up Brewing Co. I used to work with a girl named Kelly who didn’t like dark beers until she drank my porter. Then every time I mentioned brewing within twenty feet of her, she’d ask, “Are you brewing your porter?” and then she’d start telling the same story I just told you, only ten thousand times longer. Eventually, I brewed the porter again in the hopes of getting her to shut up about it. It didn’t work, but the beer was a keeper. Porter might be my favorite style of beer to brew because, frankly, it's the easiest. There are a dozen different ways you can screw up a porter and still have it turn out pretty good (it's also a go-to when drinking beer from an unfamiliar brewery, for similar reasons). The downside of such a forgiving beer style is that it's that much harder to make something that's better than Pretty Good. But since we cut our teeth on porter, and have been coming back to the style for over a decade, we've got a few tricks up our sleeve(s). So give it a try! Even if you've been disappointed by dark beers before, you may be surprised.